* Please Note: This item is the red rug shown in the picture. The tan rug can be seen here and the black rug can be seen here. A crimson colored rug will be an appropriate accent color for many different decorating schemes. This hearth rug isn't just beautiful, it also protects your home from sparks. The rug is made from synthetic fibers which perform like nylon but have lower melting temperatures. The materials and design meet the CPSC standard FF 1-70 for flammability of carpets. The rug's dimensions are approximately 72" W x 36" L so that it will fit even very large fireplaces. Is the crimson color a burgundy shade of red? What color is the crimson? Is it closer to red or rust? The crimson color is definitely closer to a burgundy color. Does this Goods of the Woods crimson half round Canyon heath rug have a non slip backing? Per the manufacturer, this rug will not utilize a non-slip backing, but will have a latex based scrim backing that would need a non-skid pad to be placed beneath the rug if used on a hard surface such as tile or hardwood flooring. I was very pleased with the quality and appearance of the crimson hearth rug. I especially like it's generous size. It was larger than most of the other rugs I looked at online. I no longer need to worry about flying embers. Great Hearth Rug-Just What We Were Looking For!! We have just done major remodeling in our home and one part entailed putting in new carpeting throughout our home. We were searching everywhere for an over-sized fireplace hearth rug to place in front of our beautiful fireplace to protect the new carpeting from those escaping sparks that would likely be popping out. We could not find one anywhere UNTIL we found this beautiful, rich crimson colored one on eFireplaceStore.com. It is absolutely beautiful and extends far enough beyond either side of the open fireplace to provide more than adequate protection for our new carpeting. What a jewel we have found in this very well-made hearth rug. It is top quality and at such an amazing great price. Thank you eFireplaceStore for providing such wonderful items for homes. We are so glad that we found you by using a Google search. You are now in our Favorite Bookmarks and we will be coming back again to shop with you for other home decor items. The 72" x 36" Goods of the Woods Crimson half round is working out great, and stays in place. 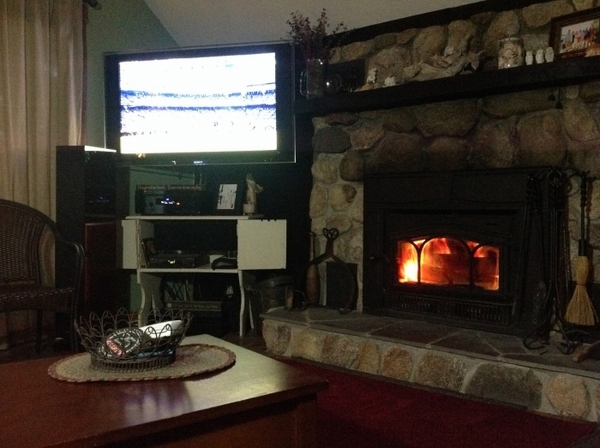 With a 12 x 9 area rug in the room, the hearth rug is partly on wood and partly on area rug. So far, it stays in place without the rug mat. We may use the rug mat eventually on the wood floor part, but see no need yet. The crimson color is on the darker side which works out great in our room. Have yet to test the cinder incidents. Received the rug in a timely way and it functions as advertised. However, the website was a little cumbersome and difficult when placing the order. ConsNone, as related to the product. I am very pleased with the hearth rug I purchased. The rug matches the description shown on the web site in both color and size. I have not used it yet so I cannot comment on the flame retardation. Shipping was very fast and arrived the day predicted. 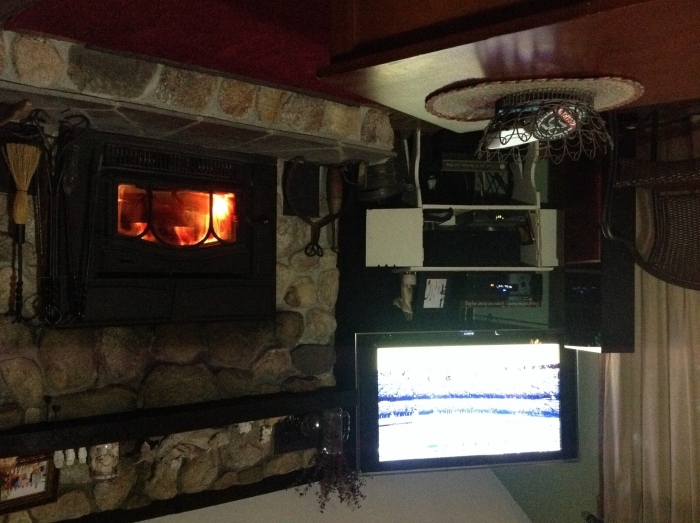 I will definitely recommend the eFireplace Store to friends. I am very pleased with the hearth rug I purchased. 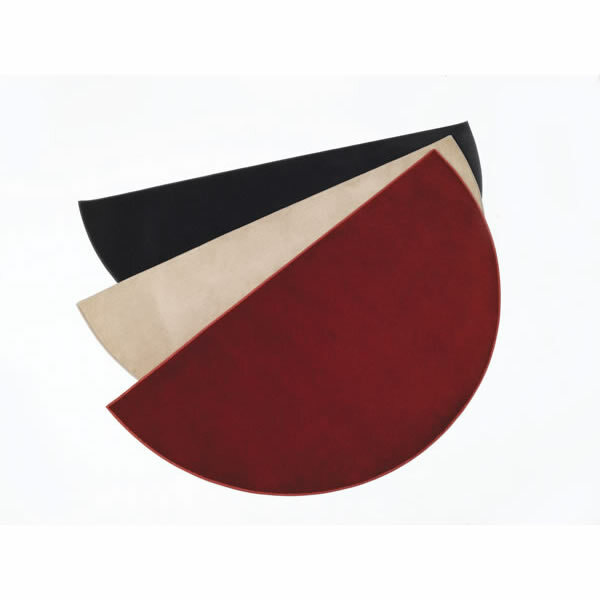 The rug matches the description shown on the web site in both color and size. Shipping was very fast and arrived the day predicted. I will definitely recommend this store to friends. The rug arrived in only 4 days despite a note that said it would be 10 days. Love it! My order arrived super fast and just as described. The rug is excellent quality. We needed a rug for the front of our wood stove. Got the half round hearth rug and it looks and works great! When it's time for a new one, I'll come back to this store to buy it. We love the look and how great it works for us. And we will be back for whatever we need for our fireplace. Thanks! I absolutely love this rug. It's the perfect size, a wonderful color, great structure, easy to clean. Love it - love it - love it. We just purchased a large wool braided rug from LL Bean and needed something that would be large enough to cover the hearth size of our wooden stove insert. This is large, beautiful and perfect! We love the color! Haven't had any hot embers hit it yet, so we will have to see how it does with hot embers! So far, we love it! I love our new hearth rug. The size is perfect for our fireplace. I like the red color. I think it pulls the room together nicely. It seems sturdy. Very happy with the product. Good quality and price too. It's just what we were looking for! Perfect size and color and thickness protection. Very Pleased! !